Moving away from play-by-play towards "running commentary and conversation" is a bold move, and one that didn't go over well with some viewers. The “Players Only” broadcast concept of filling each position in a broadcast booth with a former player has been going for a while, in particular with Turner doing that for some NBA broadcasts since 2017. And while those broadcasts have led to some flubs and some criticisms, that hasn’t stopped others from borrowing the idea. The latest on that front appears to be Fox Sports Detroit, which will use this plan for 17 Tigers’ games this season. The Southfield-based regional sports network, which has the broadcast rights to Tigers games, said this week that it will have 17 “Players Only” telecasts in which former players offer running commentary and conversation during a game rather than traditional play-by-play. It’s basically one long color commentary from several ex-players. …Ex-Tigers and FSD regulars Jack Morris, Kirk Gibson, Craig Monroe and Dan Petry will be the core lineup for the “Players Only” games. That means no Matt Shepard, in his first season in the booth replacing Mario Impemba, doing play-by-play, and no non-player sideline reporters. Shepard and others will still be a part of pregame content, the network said. Special guests will join the broadcast through the Video Call Center (VCC). “With this technology, we can check in with guys from all over the world and we plan to do just that,” said Gibson, who used the VCC during the 2018 Opening Day broadcast from Los Angeles. The VCC enables broadcasts to leverage the world’s billions of smartphones to enhance their coverage, with two-way video calls from any location, using any device. FOX Sports Detroit will be utilizing these patented technologies and services to bring in acclaimed former players, who will engage in rapid back-and-forth dialogue and even play-by-play commentary, enabled by VCC’s hyper-low-latency-return video feed. OMG. Get all those windbags OUT of the TV booth. They all try to out brag the other one. I can't take this. 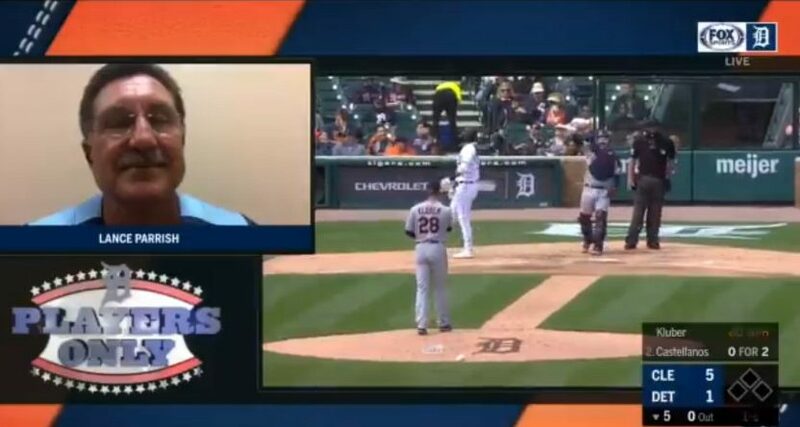 The Tigers players only broadcast has been trash. Fox Sports Detroit seriously needs to get it together. Is that what happened? I was too busy listening to Gibson and Parrish, on Fox Sports Detroit, talk about how Sparky used to line up sunflower seeds in the dugout during their World Series Run. Fox Sports Detroit… Players Only Play By Play Broadcast…Morris, Gibson, Petry, Monroe… An unmistakable disaster. Of course, it’s possible to find critics of everything that airs on TV, so a few Twitter criticisms alone won’t necessarily make the network change course. And having a “core lineup” of people (Morris, Gibson, Monroe and Petry) who were already on these broadcasts anyway provides at least a little continuity to the traditional broadcast. But abandoning traditional play-by-play for conversation carries a lot of potential for blowback, as the one tweet above shows, and it’s notable that even the floating of a similar idea for WEEI’s Boston Red Sox radio broadcasts drew a ton of backlash and even a denial from the station. We’ll see how this goes for Fox Sports Detroit this year. Hopefully none of the players involved will get in fights in the booth.